The dogs here at SSD are an extremely talented bunch. Not only can they do complex Service Dog tasks but they're rapidly on their way to becoming the next PAWblo Picassos of the dog world! They've spent months perfecting their skills of steadily holding the brush and learning how to paint on paper and canvas and are now showing their works to the public. 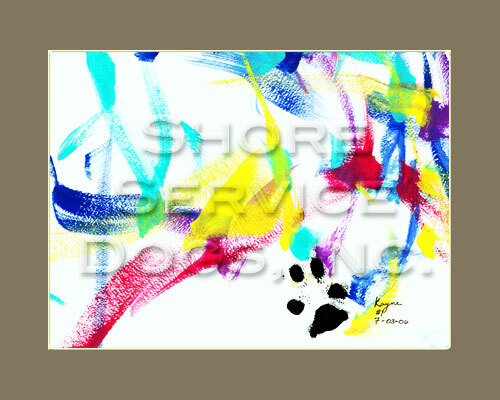 Each of these incredible one of a kind works of art are entirely made by the dogs themselves, including placing paw to painting to create unique PAWtographs on every one of their compositions. 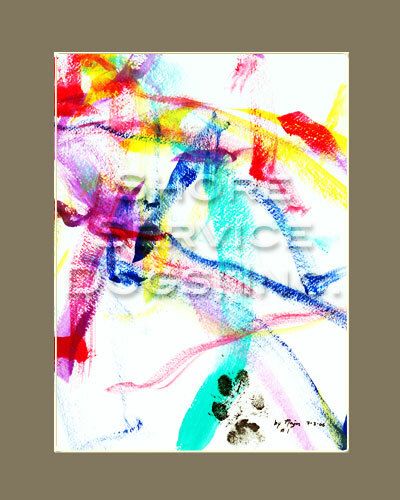 The only human touch is their name signatures, which was done by their painting assistant, Mary. The guys are talented, but they haven't quite mastered how to spell yet. Give them time, though and I'm sure they'll someday be able to do that too! Please join us as we debut their film and painting moonlighting careers to help raise money for their continued care and education! To view these amazing videos, please click on the images below to watch their masterpieces unfold before your eyes. or the video to see the painting being created. 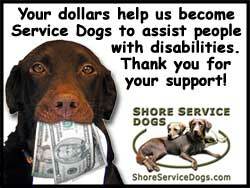 the more people will learn about Service Dogs! 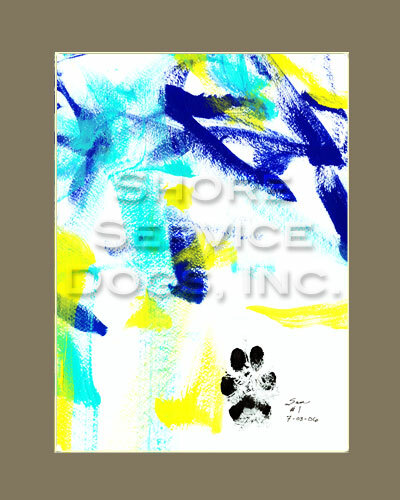 "Indigo Brush Painting Northern Lights"
To see how you can support these talented dogs by a donation for this or other PAWtograped Paintings, please visit their painting gallery. the video to see the painting being created. "Sunlit Cross Through Turbulent Waters"
Please Donate to Help Us Continue Our Education! Website created and maintained by Pionus Creations. Service Dogs that help return mobility and independence to people's lives.